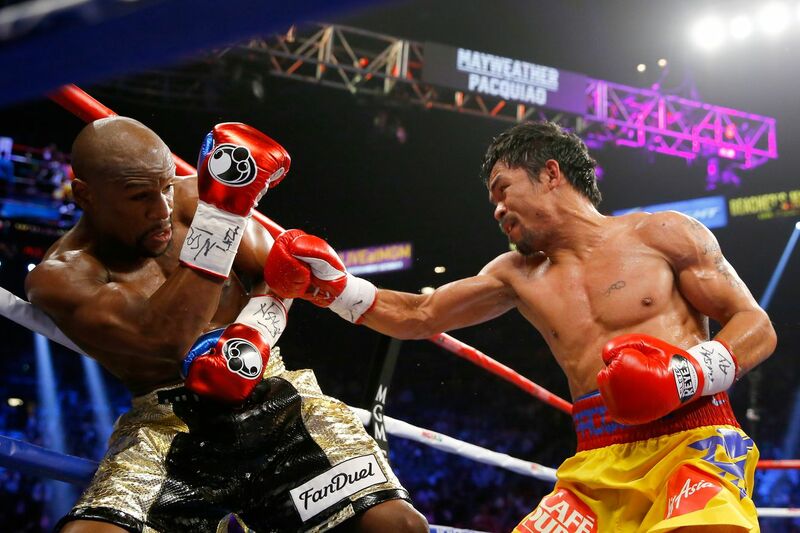 Is a Floyd Mayweather rematch next for Manny Pacquiao? Manny Pacquiao says he’d love to fight Floyd Mayweather Jr. next, provided the man comes out of retirement. Pacquiao took a dominant unanimous decision over Adrien Broner on Saturday. Manny Pacquiao has been talking a lot about Floyd Mayweather Jr., and seems rather confident that he can beat him in a rematch of their 2015 showdown. Much of the talk prior to Pacquiao’s Saturday bout against Adrien Broner has been about Mayweather and what comes next. Pacquiao hasn’t shied away from the discussion, and he didn’t after a dominant unanimous decision victory over Broner. After earning that victory, Pacquiao was asked if he wanted to fight Mayweather, who was in the building for the bout. “Floyd Mayweather, co-promoter here this evening, in the house, watching and assessing you, sometimes during the fight. Do you want that fight?” he was asked. Mayweather was then asked if he would accept the fight, as they had a camera trained on him. He was told that a “simple nod will do.” The camera focused on him for about 15 seconds as Mayweather didn’t move his head an inch. The 40-year-old boxer and Mayweather, 41, went back-and-forth in “negotiations” about a potential bout for literal years before they met in 2015, and it was a hugely disappointing fight that many believed happened several years too late. In other words, both fighters were nearing the end of their careers, though Pacquiao seemed to have lost a step much more than Mayweather. A rematch, nearly four years after it was already considered too late, isn’t necessarily that appealing from a boxing standpoint but like it or not, they’re still the two biggest names in the sport and such a rematch would make some serious money. Both Pacquiao and Mayweather know that. Is it the right fight to make? Yes, probably. As much as I personally don’t care about seeing these two fight so late in their careers, I’d rather they be fighting each other than either getting destroyed by or outboxing some of the younger talent in the sport’s most competitive division(s). I’d rather they fight each other and highlight some of the other talent on the card. Pacquiao fighting Broner made sense because Broner is in a transitional period of his career. He was once considered the future of boxing and after a loss to Marcus Maidana in 2013, his career has been downhill. At 29 years old, Broner was in exactly the right place to launch himself back into the elite-level boxer discussion with a potential win over Pacquiao. That fight made sense. A rematch with Mayweather makes sense. Does Pacquiao have a chance in a rematch? Of course. This is a man that captured world titles in a record eight weight classes over the span of two decades, and has beaten some of the best there ever was. His style is not one that has any notable disadvantages against Mayweather’s style. Pacquiao is a smart guy who knows that he has to change his gameplan — perhaps getting out to a quicker start than usual given how the first fight went — to hand Mayweather that elusive loss. You also have the fact that Pacquiao simply looked great against Broner. Sure, he was expected to win, but Pacquiao looked fast and in shape that whole bout. Then you have the recent history of Mayweather, who remains undefeated as a professional boxer but whose past two “bouts” were a publicity stunt against Connor McGregor, who is not a boxer, and a short “exhibition” against the young kickboxing prodigy, Tenshin Nasukawa. That latter bout did not allow kicking, and almost assuredly would have went a different way if it did. The point is that Mayweather is hardly being challenged at this point in his career, which is a weird statement to begin with as Mayweather is “retired” (for the third time). That said, Pacquiao has at times looked good and at other times looked awful in recent fights. It’s really hard to gauge where he’s at with his talent right now. It wouldn’t be the most shocking thing if he became the man to knock out Mayweather, but it would be surprising if he out-boxed Mayweather for 12 rounds. Other than having to fork over what will probably be at least $100 to watch what will surely be more spectacle than sport, the biggest downside is the overlooking of amazing talent coming up in just about every weight class to see two legends, well past their primes, battle it out in what will probably be a sad reminder of the great bout we missed when these two were at their peaks. The bout simply has little opportunity for excitement save for a surprise knockout, likely from Pacquiao. That would be historic and shocking, and it would give Mayweather, sitting at an official 50-0 for his career, a loss on his unblemished record. Of course, that’s a downside for Mayweather, as I personally couldn’t care less about Mayweather’s legacy. And finally, there is the usual downside of older guys going at it and potentially doing serious harm to their brains or the rest of their bodies. People retire for a reason, and a pay day isn’t always worth coming out of retirement for.